We rent a wide variety of activities and inflatables available for hire all year round so your Activity Day can take place at any time of year, indoors or outdoors. Below are are a selection of inflatable activities which can be hired for use indoors or outdoors. Inflatable Beach Volleyball is one of our many fun games played within our Inflatable Sports Arena. Our Inflatable Beach Volleyball is an inflatable twist on the sport of volleyball. The game is played by up to eight players at one time, playing a four-a-side game. The game consists of each team trying to score points by getting the ball over the net and grounding it in their opponent’s court. For more information on this activity, visit the Inflatable Beach Volleyball page. Inflatable Bouncy Basketball is one of many fun activities that can be played in our Inflatable Sports Arena. Bouncy Basketball is a twist on the classic sport of Basketball. The game can be played by up to eight people, playing a 4-a-side game. Players must bounce their way around the court trying to shoot and score in their opponent’s basketball net. For more information on this activity, visit the Inflatable Bouncy Basketball page. Take your place on the Rocking Bouncy Boxing Ring Podium and battle it out to see who is the last one standing. Contestants use oversized foam boxing gloves to try to knock their opponent into the inflatable pit but beware, the Gladiator Podium will rock from side to side with your every move so keep your balance while trying to battle with your opponent! For more information on this activity, visit the Inflatable Bouncy Boxing Ring page. Not only does our Bungee Run provide the traditional fun you would expect but it also has basketball nets at the end of the gauntlet to provide a twist and allow more games to be played on the same activity. With basketball nets fitted to the end of each gauntlet, participants must run as far down the gauntlet with their basketball and try to shoot into the net before the bungee strap attached to you pulls you back. Bungee Football is one of our many fun games played within our Inflatable Sports Arena. The concept of the game is the same as football but each player is attached to a bungee cord. Players are trying to score in their opponent’s goal whilst constantly being pulled back by their bungee cord. The Bungee Football is a two aside game. Our full length Bungee Run is 33ft long and can be used by two participants at one time. The idea of the game is to run as far down the gauntlet as possible and place the baton as far away as possible before the bungee strap attached to you, pulls you back! Inflatable Human Table Football is the life size version of the popular game known as Table Top Football (foosball). Players on our Human Table Football (HTF) are attached to a bar, not a rope, which ensures players must work as a team to score a goal! Team work is vital for all players to succeed on our Deluxe Human Table Football. We use aluminum bars rather than ropes to ensure the game potential is maximized and is as true to the traditional table top game as possible. Our inflatable football game can cater for ten people at one time, playing a 5-a-side game. The high walls on our inflatable football pitch ensures the ball stays in play for longer and a referee is always provided with this activity. Inflatable Laser Tag is an exciting and challenging non-contact shooting game which can be enjoyed by players of all ages (minimum of 6 years old). The inflatable Laser Tag game is played inside an arena which can be filled with swirling fog and subdued lighting to create an extraordinary atmosphere. The basic idea of the game, is to achieve the highest score by tagging your opponents with your Laser Beam from your Laser Gun. For more information on this activity, visit the Inflatable laser tag arena page. 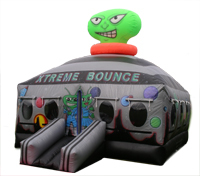 The Moon Bouncer is a covered children’s bouncy castle (under 12 years old), however it is no ordinary bouncy castle. The Moon Bouncer can be turned into a bouncy disco. We can provide speakers to enable you to plug in your MP3 player in order to create a bouncy disco with your favourite music. For more information on this activity, visit the Inflatable Moon Bouncer page. Our Inflatable Children’s Play Zone is a fun activity perfect for the younger age group. Consisting of an inflatable slide, ball pond, floating balls and mini bouncer, it is perfect for children under the age of four years old. For more information on this activity, visit the Inflatable Play Zone page. Take your place on the Rocking Gladiator Joust Podium and battle it out to see who is the last one standing. Contestants use foam pugil sticks to try to knock their opponent into the inflatable pit but beware, the Gladiator Duel Podium will rock from side to side with your every move so keep your balance while trying to battle with your opponent! 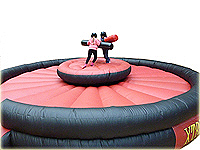 For more information on this activity, visit the Inflatable Rocking Gladiator Duel page. 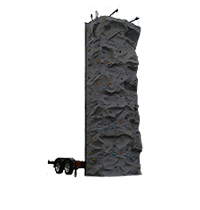 Our Portable Rock Climbing Tower is an all ability Climbing Wall, providing routes for both experienced climbers and those with no or little rock climbing experience. The Mobile Rock Climbing Tower can be used by four rock climbers at one time. Our Rock Climbing Tower has a combination of grit and granite climbing holds to offer a truely realistic experience of Rock Climbing. It uses hydraulic auto belays to safely control the descent of the rock climber and is an impressive 8m in height, so it is sure to pull in a crowd. For more information on this activity, visit the Mobile Rock Climbing Tower page.